Indians find it easy to fall in love with Chinese cuisine, because like our own native food, Chinese fare is also rich in flavours and textures. Ample use of flavourful and aromatic ingredients, peppy sauces, sprouts, paneer and a large assortment of veggies make this cuisine quite appealing to the taste buds. The exhilarating crunch of stir-fried veggies, the absolutely endless choice of Oriental starters, tongue-tickling flavours of soups that are sure to fire up your gastronomic juices, and the satiating rice and noodle options, make this cuisine a hot favourite amongst people across the world. 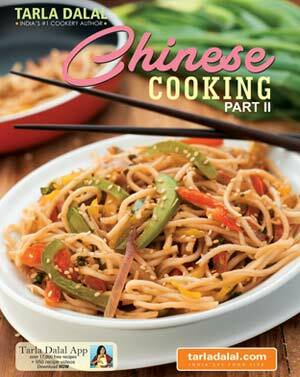 As an answer to your unabated interest in trying out more and more Chinese dishes, we have brought out Chinese Cooking Part II, as a sequel to Tarla Dalal's successful book on Chinese Cooking. While the first book has everyday favourites like Spring Rolls, Fried Rice, Manchow Soup, etc., this book has more advanced recipes and classic Oriental masterpieces like Dragon Rolls, page 19, Taro Nest with Warm Salad, page 40 and Kumpao Vegetables, page 48, which explore lesser-known aspects of this wonderful cuisine. Chinese Cooking Part II has 48 recipes, comprising of soups, starters, noodles, vegetables, stir-fries, desserts, accompaniments and basic recipes.